Amaltea and Khyle chose the Citadel gardens for their wedding. The location was by the pond in which the statue of Aeia stands. Lady Laranna MacRoy, the maid of honor, wore an exquisite ankle-length, sleeveless gown of midnight blue spidersilk cinched at the waist with an elegant ice blue sash. The best man, Lord Sylverlock Raevhaz, looked just as handsome. 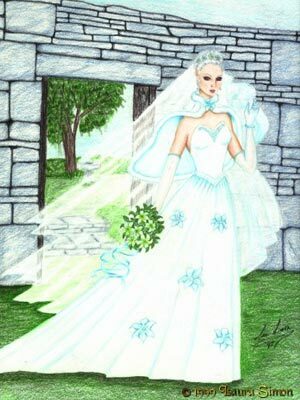 Lady Amaltea, her long hair gathered up by a circlet of white lilies, was stunning in her sleeveless gown woven of the finest spidersilk. The long flowing skirt, which dips gracefully in the back, was embroidered with lillies surrounded by pearls and diamonds. Lord Khyle Deathbringer was smitten at the sight of his beautiful bride. A soft breeze sweeps through the area and you hear the sound of far distant bagpipes. Azure seems to listen to the almost mournful sound for a moment then pulls a few matching chords from her mandolin, blending it with the sound of the pipes that grow closer. You are drawn to recall old memories and longings, perhaps those never faced. She continues to play the melody. The pipes and mandolin are joined by the distinctive sounds of fife and drum. The music no longer sounds melancholy but becomes increasingly expansive. Azure then begins to sing. Though the darkening tis clearly a lie." Yet there will be no chain for a cage." Azure raises her eyes to watch the wedding couple. As a cresendo of notes begin a dragon bursts from nowhere to leap into the air, spreading snow white wings touched with hints of gold. Azure's voice surrounds you like a gentle dream, weaving it's own magic. Tis nothing to a heart that refuses to grow still. For as long as you are near this heart will always sing." Azure smiles as the music becomes pastorial. Visions of a hillside pass quickly while the dragon swoops upon unsuspecting prey. It raises its head to gaze upon the wedding party with golden eyes, then raises its head in a keening cry. Azure sings. Through the very fires which wouldburn me." "So, take this gift, tis a love meant for all time. While the sands move through a glistening glass. It will last til the sands are gone and far beyond. And so t'will just always be within the rhyme." Azure grins as the music softens. The fife and drum fall away leaving the pipes and mandolin. There is a joyful cry from the dragon as a golden dragon, smaller but no less majestic, sweeps into the sky above. Azure continues. And answer just one more call." Azure smiles as her hand drops from the instrument's silvery strings. There is a breath and all grows silent. Both dragons wink out, gone from the sky.